Pseudo force in Physics-did you know this? 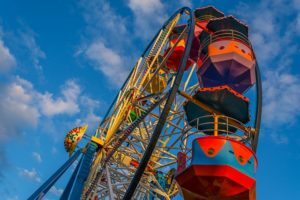 3 Important Relationships between the quantities of Circular Motion and Linear Motion: In this post we will focus on the definitions of circular motion and linear motion first which will show their basic differences as well. In addition to this we’ll derive couple of interesting relationships among the quantities of these 2 types of motion. In this post of ‘Mastering Physics fundamentals’ series, first of all we will derive relationship between angular displacement and linear displacement. Relationship between angular velocity and linear velocity will also be explored thereafter. Finally we’ll derive the relationship between angular acceleration and linear acceleration. Circular motion of an object is its movement along the circumference of a circle. You can define it as the rotation of an object along a circular path. It can be uniform, with constant angular rate of rotation, or non-uniform with a changing rate of rotation. Linear motion or Rectilinear motion is one dimensional straight-line motion. This type of motion describes the one dimensional movement of a particle or a body. A body experiences rectilinear motion if any two particles of the body travel the same distance along two parallel straight lines. Lets list down the variables of Linear motion first. The most basic variables are Distance traveled, Displacement, time etc. The next level variables of linear motion are Speed, Velocity, Acceleration, Momentum etc. We discussed already in a previous post about the difference between distance traveled and displacement and the difference between speed and velocity. The variables mentioned in the Linear motion section have their individual counterparts in case of Circular Motion. We will discuss some of these in this post and draw a relation with their Linear Motion counterparts. Say a point object is moving in a circular path of radius r. Let’s say the center of this circular path is O. 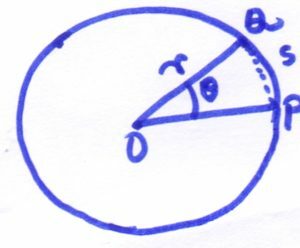 At some point of time say the particle is at point P on the circumference of the circle. At this moment the radial vector of this motion is OP. After a time gap of t the position of the object becomes Q (obviously on the circumference of the same circle) and the radial vector is OQ. Now say the angle between OP and OQ is θ (theta). Hence the angular displacement of the particle in time duration t is θ . In addition to this angular displacement the particle is having a linear displacement as well when traveling from point P to Q. Here PQ is the linear displacement, and say it is designated as s.
Now consider the right angled triangle ΔOPQ. Now, as per Trigonometry, if the angle θ is very small then Sine θ is equal to θ. So from equation (1), we get θ = s/r i.e., s= θ r ______________(2). Here we get the relation between linear displacement and angular displacement. During the circular motion an object experiences angular displacement as well as linear displacement, therefore it will have angular velocity as well as linear velocity at any position on the circle. The direction of the linear velocity of the rotating object at any point is along the tangent to the circle drawn at the point where the object is positioned at that moment on the circumference of the circle. And angular velocity is being made by changing the angular position with time. Angular velocity is identified with the sign omega (ω). And ω = θ /t _________(3). Say at point P the linear velocity of the object in rotation is V1. In addition to this at point P angular velocity of the rotating object is ω1. Similarly at point Q these are V2 and ω2 respectively. We already said that the time taken to travel from P to Q is t.
where Alpha (α) = (ω2-ω1)/t = Rate of change of Angular Velocity = Angular Acceleration. Q1 ) An electric fan was rotating with a speed of 210 rpm. Its velocity is increased to 630 rpm in 11 seconds with the help of a regulator. Calculate the angular acceleration of the fan. Time elapsed =t= 11 seconds. Here are 2 more posts to understand Momentum vs Angular Momentum, inertia vs moment of inertia and Force vs Torque. Now you can share this post as much as possible! Use the social media buttons on this page! Subscribe by filling the small subscription form placed at the top right pane of the page. This will help us to keep you posted on our next posts.